5 Apps for IIT Students. 5 Apps to Help Fulfill Your IIT Dream. How to Use Technology to Aid Me in IIT JEE Preparation. Millions of students in India harbor the IIT dream every year, but only a few make the required effort to nurture it and turn it into a reality. It is not easy to study 5-10 hours a day consistently for two years or more to understand all the concepts in Physics, Chemistry and Math covered in your Class XI and XII, and to master their applications. It requires unflinching discipline and a certain degree of resilience and passion to make such a sacrifice on a day-to-day basis, especially for the teenaged mind. While there is no replacement for teachers and books, the present-day generation certainly loves its mobile apps. They feel happy to get a chance to fidget with their gadgets as the adaptive learning platforms of the modern-day educational apps use gaming techniques to keep studies interesting for them. Khan Academy app is available on both iOS and Android platforms. 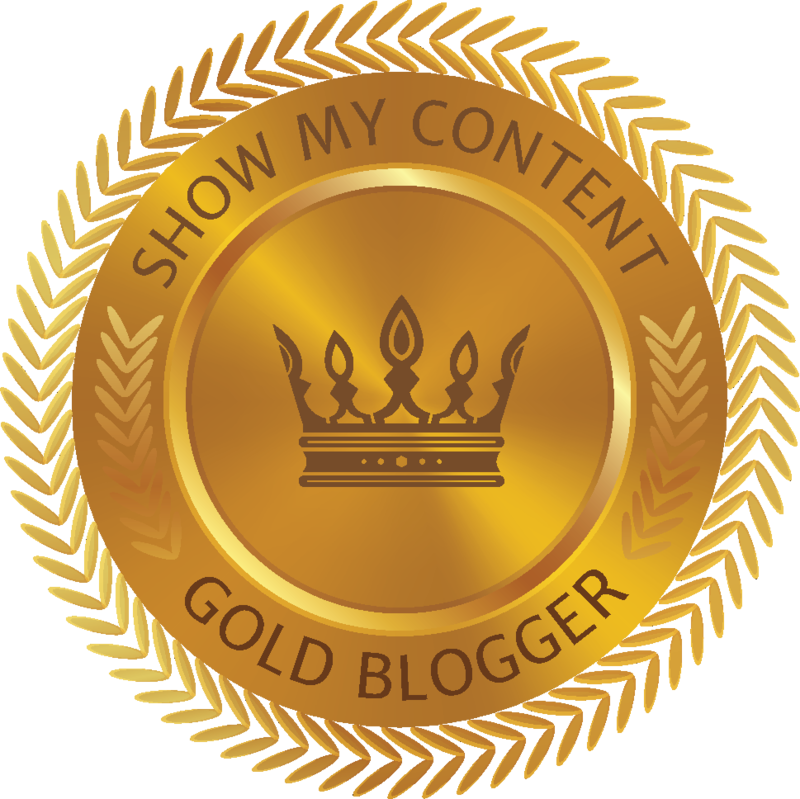 It has over 10,000 videos in various subjects that we cover in our schools. Besides English, Khan Academy lessons are also available in French, Spanish, Brazilian, Portuguese, Norwegian, and Turkish on iPad and iPhone. Here, IIT aspirants will find high-quality and detailed courses for Class 11 and Class 12 students. 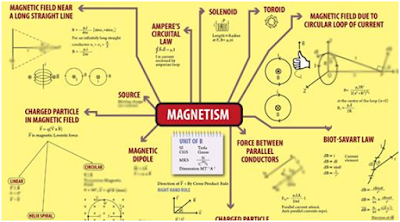 These courses are easy to understand and can help you pick up Physics, Chemistry and Math concepts easily. It is a great app to help with your homework or to re-enforce lessons you have learned in your school. The app provides you assignments that are adapted for small screens and are interactive in nature. You can also sync your progress across devices and continue to learn offline when you want. Its best feature is that it is free but still does not have any spam or ads that might distract you while you are studying. This online mind mapping tool is an excellent app for taking notes, brainstorming, and of course, making mind maps. 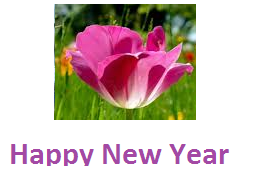 It is a web-based app and can work in Windows, Mac Os or Linux platforms. 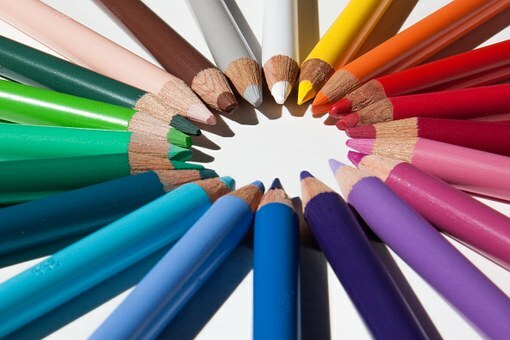 A mind map is essentially a diagram in which you represent facts and information in a visual form. The central idea is represented in the middle of the sheet while its branches and sub-branches present information in clusters. If you are a visual learner, mind maps can help you pick up any information quickly. Mindmeister allows you to share your mind maps with your friends and peers in real-time. It means that if you like to study in a group, you can share your mind map with anyone you like and make it a fun activity. The collaborative and versatile learning raises the level of student engagement and improves the students’ achievement levels on any given topic. Engineering aspirants can use it to learn faster and make better revision notes. 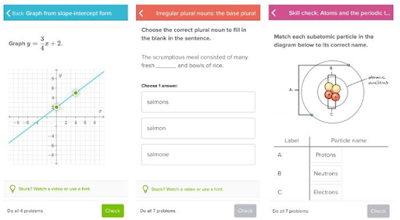 They can use the app to note down formulae and essential laws and theories in a chapter in the mind map format, and use it to revise the topics just before exams. This app is a boon for IIT JEE aspirants as well as medical aspirants. 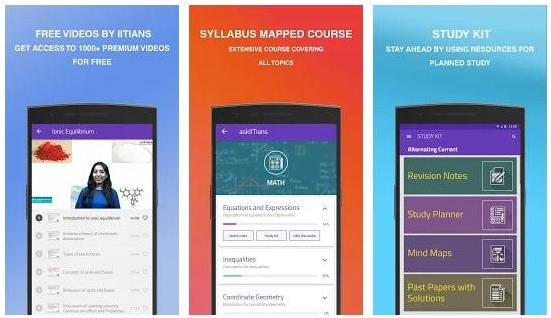 Founded by two ex-IITians, the askIITians app contains everything you will need for your JEE Main or JEE advanced preparation – from important topics you should focus on to preparation tips to an ever-expanding question bank to offer you sufficient practice. We have mentioned mind maps above. This app offers you readymade mind maps you can use for free. Here, you can take chapter-wise tests, unit-wise tests, and subject-wise tests. It also offers you a detailed analysis of your test performance, which includes how much time you took to solve each question vs. time taken by other students, the number of questions attempted by the question, and the number of questions answered correctly by students. You can also take complete test series based on JEE exam pattern, which can help you learn time management, point our your strong and weak areas, and give you a fair idea about where you stand among other students who took the online tests. You can also find hand-written revision notes for each chapter here. These notes are prepared by IITians and include all the points that you’ll need to remember. You can review these notes from time-to-time to cement them in your mind. Solved examples in NCERT books and practice questions they include are considered quite important from the JEE Main point of view. Hence, this app includes NCERT solutions for each chapter too, which engineering aspirants may use to cross-check their answers and check the best techniques to solve a specific question. 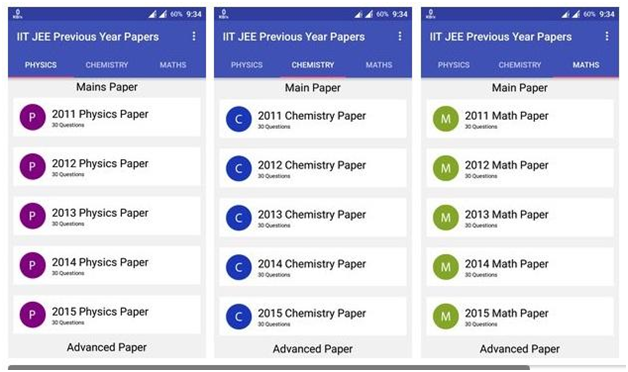 IIT JEE Previous Year Papers app by APK allows you to solve past years’ question papers of JEE Advanced offline. It simulates the actual competitive exam environment and presents the actual conditions asked in the prestigious engineering entrance exam in the quiz format. The students can opt to solve just Physics questions, Chemistry questions, or Math questions during their IIT JEE preparation. 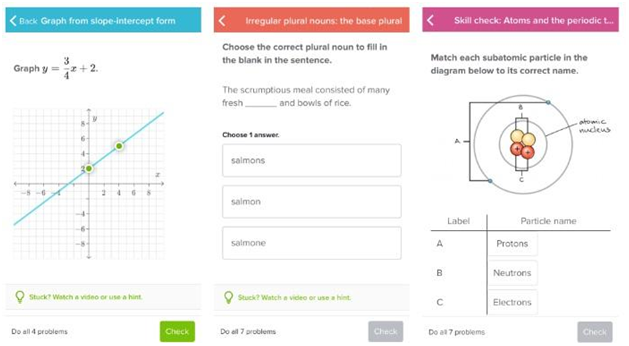 If students have a doubt in a question, they can select one of the given options and see the solved answers instantly. It does not require any Internet connection and is a free-to-use app. 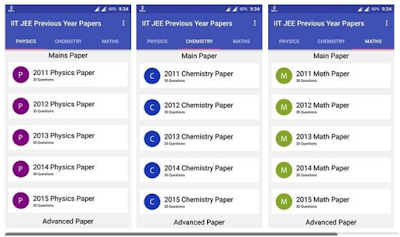 There is another free app called IIT JEE Advanced Papers that offers similar services. Each set needs a minimum of three cards. Each flashcard has a front, back, a hint question, and options to add photos and descriptions if you like. 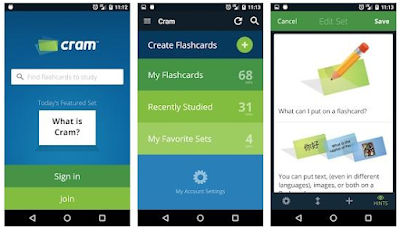 You can either browse through the cards one-at-a-time to memorize them or set them at the ‘cram’ mode where you learn each flash card until you get all points on it correct and then move on to the next level. With digital education taking the lead, studies have become more interesting. If you want to be an IITian, you’ve got to learn to stay ahead of the curve. These apps can help you improve your performance in the exam and make your dream come true. Please write your experiences about 5 Apps for IIT Students.